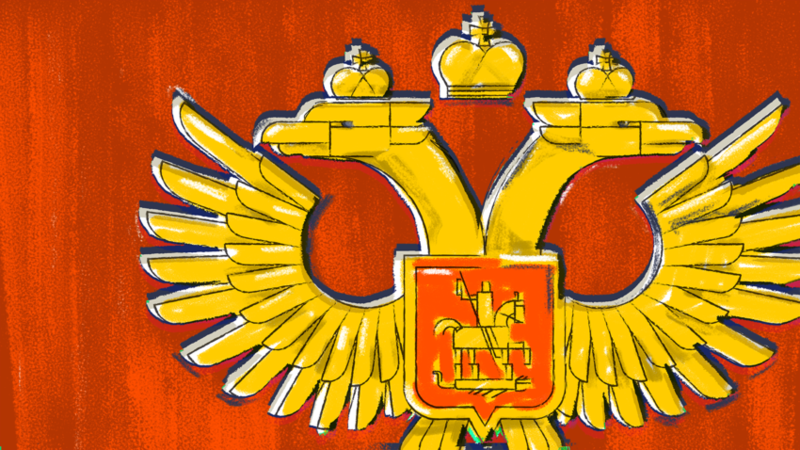 The imperial bird with two heads simultaneously facing East and West has been Russia’s official coat of arms for centuries, with only a break during the Soviet era. The emblem, however, is far older than the country, with roots dating to ancient civilizations. An eagle on a country’s coat of arms is quite common – this bird is as popular a national symbol as the lion. “He is the king of birds; just like the lion is believed to rule all animals, and he is associated with the cult of the sun,” Georgy Vilinbakhov, head of Russia’s Heraldic Council, explains. The eagle has been emblazoned on the insignia of numerous empires. Roman legions held standards with the glorious birds when going into battle, and even today many countries have eagles on their official coats of arms. In the U.S., the Great Seal features a bald eagle holding 13 arrows and an olive branch. Meanwhile, a black eagle is on Germany’s coat of arms. Russia’s eagle, however, is special – it’s double-headed, with each head looking in opposite directions. Still, this is not unique: Serbia, Albania and Montenegro also have coats of arms with two-headed birds. What’s all this about? Isn’t one head enough? The double-headed eagle is an old birdie, and its first images (carved in stone) are attributed to the Hittites who lived in the Middle East in the 13th century B.C. Since then, the double-headed eagle has appeared from time to time both in East and West. However, it was the Byzantine Empire (395 AD – 1453) that saw this bird soar to new heights. Most historians believe that all the nations associating themselves with the double-headed eagle inherited this from Byzantium through dynastic marriages. “In the Middle Ages, you couldn’t just take the other country’s symbol simply because you liked it; it was a sign of an alliance, of good relations,” Pchelov said. That’s how Serbia, Albania and Montenegro got their coats of arms, and Russia followed suit. In 1472, Ivan III, Moscow’s Grand Prince, married Byzantine princess Sophia Palaiologina. Several decades later, in 1497, the first official Russian seal with the double-headed eagle appeared. Embracing the Byzantine heritage was extremely important for Ivan. In 1453, the Turks had captured Constantinople, and so Russia became the leading Orthodox power. Thus, the wings of its own double-headed eagle began to cover both West and East. “Before the Byzantine Empire ceased to exist, it always was perceived as a greater power. And even after its fall, Russian rulers wanted to associate Russia with the Byzantine symbol,” Yevgeny Pchelov explained. In Russia, the double-headed eagle was always accompanied by another national symbol: a horseman slaying a serpent with a spear, portrayed on a shield. The horseman is a symbol of Russia’s capital, Moscow, and usually represents St. George the Victorious. However, since Russia is a secular state, this interpretation is unofficial. The coat of arms has changed throughout history, with the eagle changing from gold to black, and then back to its current gold. Also, it has gained and lost the crowns over its heads. Currently, each head is topped with another crown ‘floating’ between them, which once more symbolizes unity. In its talons, the eagle holds an orb and a scepter – symbols of power and authority. The current interpretation of the coat of arms is quite similar to those used in the Russian Empire. After the monarchy was overthrown in 1917, the eagle became white (maybe it just turned pale). With the Bolsheviks in power, the bird had a rest for about 70 years, and was replaced by the hammer and sickle. Since 1993 the eagle is back, still looking in opposite directions, and wearing three crowns on two heads. How did Russia get its flag? Why are Russians so fearless?